So far in Melbourne we've had a couple of moderately warm days - mid 20s or so? In our house, we found the ground floor very comfortable - not hot at all, which is a big benefit to the thermal mass of a big concrete slab. Upstairs - bit of a different story. Quite warm, even with only 2 west-facing windows. Definitely need some proper cooling for when the massive Melbourne heatwaves hit! Anyway, this is something we planned for back when designing the house. The cost for refrigerated AC as provided by the builder was something like $20,000+, and the large running costs of AC are a bit offputting. We pulled out the tiny Breezair evaporative cooling unit that was in the old house we demolished, installed it in the top floor of my parent's house and was surprised at how effective it was. AC pros: Gets very, very cold, even on the hottest days. AC cons: Expensive to run, recycles the air. 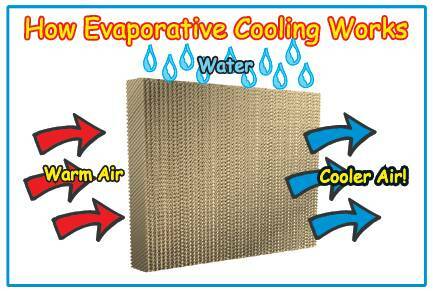 Evaporative pros: Cheap to run, cycles fresh air through the house. Evaporative cons: Possibly will struggle on the very hottest 40+ days. And the arguments to and from could run for years - if you're so inclined to read more, check out this great lengthy discussion on Whirlpool. I love being ice-cold with AC, but I figure we might only need it a few days a year. So the plan is to install the evaporative cooling upstairs and maybe add in a split system AC downstairs if we find we need it. We paid for upgraded roof trusses, roof water & powerpoint for future evaporative cooling installation, but after speaking to a few evaporative installers, they said it doesn't really make much difference. Oh well! Anyway, I'd booked in a few quotes today. Coldflow were meant to be first, but seeing as they couldn't even be bothered turning up or calling to explain why no-one came, they're immediately off the list. If their attention to detail and customer service is this bad even before making a sale, why would I ever bother buying anything from them? Thumbs down. Weather World didn't want to send someone out, so they emailed a quote for a Breezair 210 with 8 outlets based on floorplans I emailed them prior. Finally, Maroondah Heating & Cooling had the final visit of the day, and got the job. Damien had a peek up into the roof, spent some time measuring up the rooms and discussing the various options available. Ultimately we settled on the Braemar 550 with 7 outlets; with specific attention to the size of the outlet in each area plus placement of the unit itself, he reckons we should get pretty good cooling to the whole house including downstairs - here's hoping! Installation is booked in for next Tuesday. Chose the Braemar instead of the Breezair as they're made by the same company (Seeley International), but the Braemar have fewer problems due to their fan design. And for those still at decision-making stage, should you get evaporative cooling done through the builder? Well, Metricon wanted $5500 for a 5 outlet Bonaire Summerbreeze, which was undersized for our house. Our quote for a 7 outlet Braemar was over $1000 less than that, with the top-of-the line unit. Finally, while he was up in the roof cavity Damien confirmed for me what I had suspected - my antenna isn't connected to the Starserve system, with the coax wires just dangling out in open space. Good job by the data installers, real good job there. Unfortunately here is another area that Metricon is failing in after-sales customer service, having reported to my SS, my CSC and to the girl who did a follow-up courtesy call that my antenna hasn't been connected, what's been done about it? Nothing, zero, nada, zilch. I'll be writing a rather pointed letter come three-month review time, because after paying about $1500 for an antenna, Starserve and a bunch of TV points, you'd think you'd actually get a working product rather than something dead-on-arrival. And the worse thing is, a technician could splice the cables together in about 5 minutes to solve my problem. Instead, I get to complain endlessly to everyone who walks into my house about a problem that shouldn't have existed in the first place - "Yes, I know I've got rabbit-ear aerials on my TVs, because my antenna isn't connected". So, to everyone building, make sure your antenna is connected to whatever TV outlets you've paid for, because when's something broken, it's probably going to stay broken for a while. Not to mention all the other issues from the "completion" inspection - all little fiddly things which could be easily fixed but aren't, and I guess they'll just be added to the 3 month problem list. I have come across your blog and found it quite interesting. At the moment we are in 2 minds of either installing a Brivis or Breamar evapotative air conditioning unit. There arn't many reviews on the Breamar unit and I was wondering how the unit is going and if you had any problems so far?? Also how the unit holds up during Melbourne's heat wave?? Your comments and feed back are much appriciated.